You are most definitely in the right place if you are looking for the very best high-quality jewellery available online in the UK. Mad About Diamonds have been the pioneers of exquisite jewellery on the internet for years now and our range is absolutely second to none. 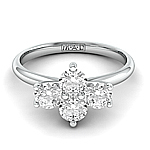 Let us create the perfect diamond cluster ring or platinum cluster ring for you or the one you love. A platinum cluster ring is a hugely popular choice here at Mad About Diamonds as you have the ability to choose a collection of stones to suit you perfectly. 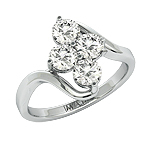 The cluster ring can be designed to form an array of patterns such as flowers or hearts. A diamond cluster ring is all the more beautiful as it has many levels and stands out dramatically. They do often provide a large show of diamonds however so bare this in mind when going about your daily activities. As with all of our jewellery, our diamond cluster rings are all are made from the finest quality diamonds and metals so you know you are receiving a ring of sheer quality. A cluster ring from Mad About Diamonds is the perfect way to symbolise your love as it makes a real statement. Whether you go for a diamond cluster white gold engagement ring, yellow gold or platinum this piece of jewellery is certain to put a smile on the face of your partner every time. 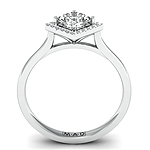 Purchase your Cluster Ring, handmade engagement ring or diamond engagement rings online from Mad About Diamonds. Our personalised service will ensure you get the best possible deal on your Cluster Rings!